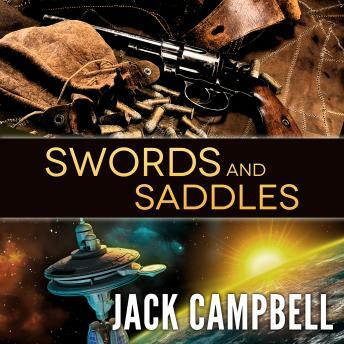 Swords and Saddles is a must-listen collection of three novellas from New York Times bestselling author Jack Campbell. The Rift: Answering a distress call from a colonized planet, a combat team finds themselves ambushed. They manage to scrabble their way to a remote research facility in the countryside, joining a group of schoolchildren that have holed up with the researchers-three groups united in fear that their lives will last only as long as they can avoid discovery by the aliens that have come to their planet. Swords and Saddles: When lightning strikes Captain Ulysses Benton and his U.S. Cavalry Fifth Regiment, they recover to find an ancient structure in the desert that they've never seen before-and writing in a language none of them recognize. It soon becomes clear that wherever it is they are, it isn't 1870s Kansas.